We have a fresh Christmas tree this year for the first time in our marriage. (We’ve always used an artificial one before.) 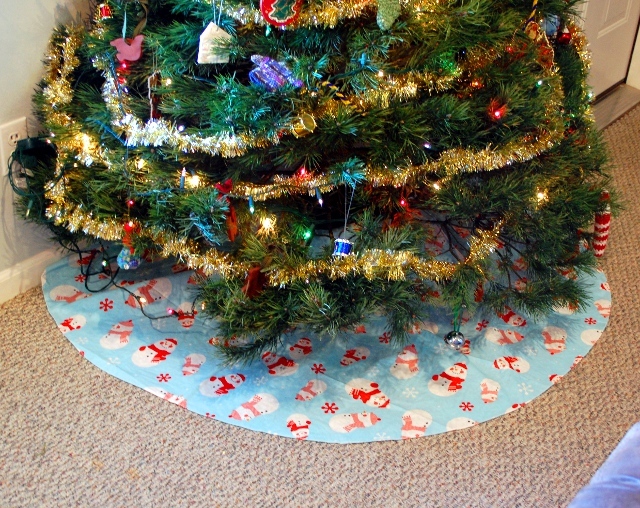 I’ve meant to make a tree skirt before, but somehow it just looks wrong with the tiny little fake-tree base and so I didn’t feel too bad that I never got around to it. This year, though? Real tree. 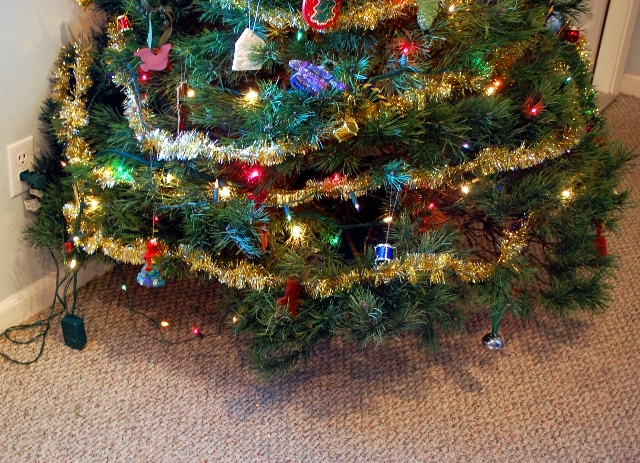 And a real tree needs a tree skirt. As I am both cheap and pressed for time, this is what I came up with. All you need is a round Christmas tablecloth (I got a vinyl one for under $4) and some scissors. The tablecloth I used has a 60″ diameter – I could have gone a little smaller but it wasn’t too big. 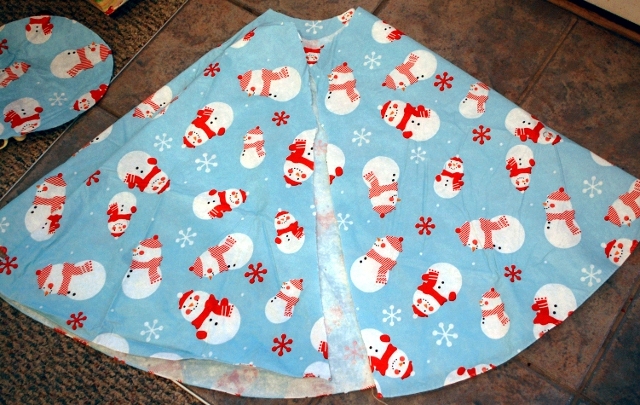 Next, fold your tablecloth into a wedge, like you’re getting ready to cut a snowflake. CAUTION: my tablecloth was folded when I pulled it out, but it wasn’t folded very neatly. Make sure to even the edges of your tablecloth for the best results. Snip off the point. Remember, however much you cut off is going to be half of the hole, or in other words, the hole will be twice as wide as the piece you snip off is long, so make sure you don’t overdo it. Then, cut a straight (er…mostly straight…) line from the edge to the hole in the middle. Make sure you only cut through one layer. I like this! I’m thinking about doing this with a vintage table cloth and my sewing machine. A bit more expensive…but our current skirt has seen better days! 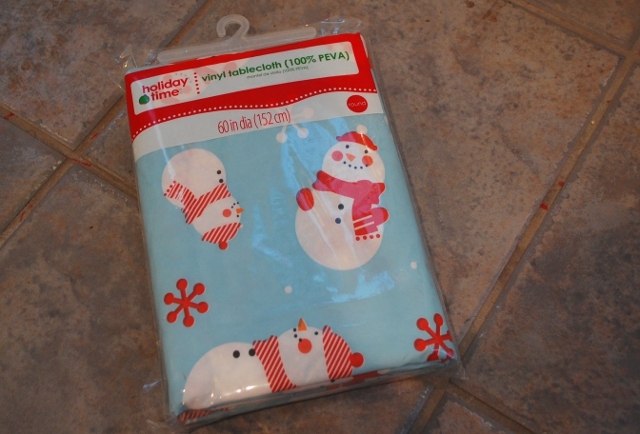 Yeah, the tree skirts at the stores are outrageously expensive… I don’t need velvet and gold braid, vinyl snowmen are just about our speed.